Rob Anthony says they’re the best three days of the year. He was referring to the Children’s Miracle Network radiothon that he and others at WMAS radio — which he now serves as program manager, ‘afternoon host,’ and operations manager — have been part of for the past seven years. This is an intense, emotional, rewarding three days that raise money for Baystate Children’s Hospital (more than $200,000 during the 2008 edition) and each year creates memories that last a lifetime. Like 11-year-old Devon Roy’s speech on Rosa Parks. It was perhaps the most unforgettable moment of this year’s radiothon, staged just a few weeks ago. Roy was supposed to deliver that address at her Greenfield school’s history fair, but she had to be in the children’s hospital instead because of her respiratory illness. So Anthony got the idea to have her read the speech over the air, with the entire school listening in the auditorium. Anthony says the radiothon is just one reason why he says of his job, “calling it work is a bit of a stretch.” In short, he loves music, and thoroughly enjoys being on the air. In fact, he left another station in the area for his first job at WMAS, at a considerable reduction in salary, because it afforded him the chance to get behind the microphone. He’s still there, working the 3 to 7 p.m. shift, while also helping to set a strategic plan for the station, and charting an aggressive philanthropic course that includes work to assist groups ranging from the children’s hospital to the Children’s Study Home. An avid sports fan and NASCAR follower (he’s a Dale Earnhardt Jr. devotee), Anthony must balance these interests and his work in radio with family, and especially his 8-month-old daughter, Kaitlynn. Age 36: Chief Forester/Sawmill Manager, Cowls Land & Lumber Co.
Shane Bajnoci says there’s some science associated with sustainable forestry, but it’s also a bit of an art. “It’s a forever-changing job, and I’m always trying to explain it to people so they understand what we’re doing,” he said, noting that it all boils down to managing a resource — the region’s large, but not limitless, supply of forest land — so that the needs of current and future generations can be met. Bajnoci started his career at Cowls Land and Lumber Co. 12 years ago after earning a bachelor’s degree in Forest Conservation at UMass Amherst, and since then, his responsibilities have only grown. He leads a crew of 14 that harvests and manufactures some 2 million board feet of logs and lumber per year, while also managing thousands of acres of land and their boundaries in nearly 30 towns across the region. His post also requires completing countless pages of state and federal paperwork, drafting management plans for the year, contracting with local loggers and truckers, and cultivating a small Christmas tree farm. Bajnoci also sits on several industry-related boards, including the Mass. Wood Producers Assoc., the Mass. Assoc. of Professional Foresters, and the Pelham Forest Conservation Committee. But despite this workload, Bajnoci added another bullet to his resume this past year, leading Cowls’ participation in the Inaugural American Woodcock Initiative. The business joined forces with the Mass. Division of Fish and Wildlife, the Ruffed Grouse Society, and the Wildlife Management Institute to launch the program, which focuses on habitat-management efforts that can curb the decline of various wildlife populations in addition to the woodcock, such as the New England cottontail, wood turtle, and gold-winged warbler. 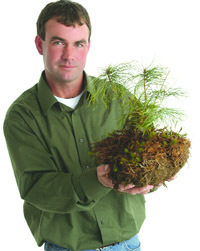 Bajnoci has incorporated initiatives that benefit these species into his annual plans, and, in 2007, garnered a Forest Stewardship Award for his company from the International Assoc. of Fish and Wildlife Agencies. Thinking outside the box comes naturally to Dennis Francis. So does thinking about the box and ways to shape it into a highly successful business venture. But that would be expected from someone who founded a company called America’s Box Choice (ABC), a Holyoke-based enterprise that now does $2.5 million in sales annually only a few years after Francis started the operation from the back seat of his car. After being laid off from a job at a box-making company in 2004, Francis decided to strike out on his own and act on a business idea that he wrote down on a napkin one day. “The general idea was just to sell boxes and moving supplies to people who were moving in the area,” he told BusinessWest. Just four years later, Francis is selling everything from mailing tubes to bubblewrap out of a 30,000-square-foot warehouse, and servicing more than 285 customers, including 180 UPS stores throughout New England. But Francis’ ambition doesn’t stop with his company. He has been a major player in rejuvenating the Springfield Salvation Army’s Coats for Kids campaign. His company has provided boxes for the drive, and has transported the coats for cleaning. In addition, Francis rolled up his sleeves and helped families pick out coats during the annual distribution event last fall. Francis told BusinessWest that seeing the families in need made him want to keep on giving. “You don’t realize how much help these kids need until you get involved,” he said. When he’s not running his business or volunteering, Francis and his wife, Lori, like to travel. Recently back from a trip to Aruba, he said that, now that his business is off the ground, he’d like to travel more and perhaps take a trip across the country in the near future. If he needs any boxes, he’ll know where to get them. Imagine walking into a court case thinking you’ll be defending a company that’s having trouble with a so-called ‘alien’ (most often interpreted as a person residing and working illegally in the U.S.), only to find out that the plaintiff actually believes he’s an alien from outer space. This is just one of many interesting cases that Meghan Sullivan has encountered during her career. “Sometimes we come across people and cases that give us real pause,” she said, actually pausing for effect. And that partly explains why she loves her job as a labor and employment lawyer. But doing battle in the courtroom is just one way Sullivan likes to spend her time. She also enjoys taking a spin on the Holyoke Merry-Go-Round, which she has been riding since she was a child. “My grandfather used to take me to the carousel when it was at Mountain Park,” she said. “He stood for hours while I rode it.” After the park was closed in 1987, the ride was moved by a group of citizens to Heritage Park in Holyoke so that people could continue to enjoy it. Today, Sullivan serves on the board of the Holyoke Merry-Go-Round, something in which she takes great pride. All women can be divas. That’s a motto that Kelly Galanis lives by. Not only is she truly the self-proclaimed “diva of data,” as the systems and research manager for Westfield State College, but she also spends much of her free time helping other women find their diva side. Galanis says her values for success were instilled in her at Bay Path College, where she spent six years attaining her associate’s, bachelor’s, and master’s degrees (the first person in the college’s history to earn three degrees consecutively). “I was able to collaborate with so many professional women there that I felt the need to do the same for other aspiring women,” she told BusinessWest. As a member of multiple women’s organizations, including the Women in Philanthropy of Western Mass., Dress for Success and its Western Mass. chapter, and Massachusetts Women in Public Higher Education, Galanis continually lends her time to ensuring that all women share her drive to be the best they can be. She also likes the fact that meeting with a variety of strong and successful women in these organizations lends clarity to tough topics and event planning. Even with all of this on her plate, she still finds time to help senior citizens learn how to use eBay, Digital Scrapbooking, and Microsoft Office by teaching a class at WSC through its Lifelong Learning Program. “It’s a lot of fun to see them get so excited about learning how to use the different resources,” she noted. With that, it’s hard not to think that the diva of data is more like a diva of empowerment, which, in the eyes of many, is quite divine. He was only getting started at Brown University, but Michael Sweet already had his career plans all figured out. “I knew what I wanted; I was going to be a business lawyer at Doherty Wallace Pillsbury and Murphy,” said Sweet, adding that this ambition was actually inspired long before he got to Brown — and, later, its law school — by the words and deeds of long-time lawyers at that Springfield-based institution, including his former lacrosse coach in Longmeadow and mentor, Craig Brown. Sweet fulfilled his stated career goal — his office is just down the hall from Brown’s — but not before taking a slight detour, specifically a two-year stint with the prestigious New York firm Winthrop, Stimson, Putnam & Roberts. How he went from Wall Street and representing Fortune 100 companies to Springfield’s Main Street is an intriguing story, one the Economic Development Council of Western Mass. might want to borrow as it goes about selling the Pioneer Valley. That’s because, while Sweet was once determined to make his career in the Valley, he thought he had to see the bright lights and the big city first — especially after hearing from other students at Brown about their plans. Only after doing so did he realize that he was right the first time. “I had to get it out of my system,” he said of his New York experience, adding that he came back home to realize his early career ambition — and to make a difference in the community. And he’s doing so at places like Gray House, a large, gray house in Springfield’s North End that has created a number of programs to help disadvantaged families. Sweet has been involved with Gray House for a decade now and currently serves as president of its board of directors. He’s been involved with many other groups, including the Springfield Enterprise Center at STCC. Giving back is part of the corporate philosophy at Doherty Wallace, he said, adding that this is one of many lessons that Brown and others have imparted to him — not through words, but with actions. And now, he’s providing inspiration to others. For Jennifer Glockner, it’s all about getting the word out. The director of public relations for Lenox-based Winstanley Associates handles not only the regular PR work for her firm, but also similar duties for some big-name clients such as Spalding. Recently, she helped coordinate community events surrounding the visit of Prince Saud bin Thunayan Al-Saud of Saudi Arabia, chairman of SABIC, the new owner of GE Plastics (now SABIC Innovative Plastics). But it wasn’t always PR and the Berkshires for Glockner. Starting out in Kalamazoo, Mich. at a television station, she relocated to Denver, Colo. to become producer of a top morning show. The show even ended up with the highest ratings in the country for its market. Then, after meeting her future husband, who is originally from Pittsfield, she took another leap and moved to Massachusetts to become an advertising salesperson for the Berkshire Eagle. Despite her taste for new frontiers, Glockner thinks she’ll be staying put for a while. Since moving to Massachusetts in 2003, she has become involved with a variety of community organizations, including the Berkshire Leadership Program Committee, the Mass. Audubon Berkshire Wildlife Sanctuaries, and the Pediatric Development Center. Most dear to Glockner, however, is the Junior League of Berkshire County. Initially coaxed by her mother-in-law to join so she could meet people and become familiar with the area, Glockner ended up falling in love with the organization. In fact, Glockner is slated to become the next president of the group. In her spare time, Glockner loves to ski, something she picked up in Colorado. But now that the snow is almost gone, you can find her and her husband, Theodore, trekking across the Berkshires with their loveable dog, Pudding, a 10-year-old chocolate lab, who can’t get enough of the outdoors — or carrots. Age 31: Director of Development and Public Relations, Girls Inc.
Heidi Thomson has a real passion for spurring social change, promoting human rights, ending violence against women, and raising funds for all of the above. These are weighty tasks, to say the least, but Thomson has already proven that she has the chops. Since joining Girls Inc., a nonprofit organization in Holyoke that works with young women, especially in underserved areas, Thomson has opened Holyoke’s first girls-only teen center, executed the launch of a $1 million HIV and substance-abuse-prevention project, spearheaded a mentorship program, and increased individual giving to Girls Inc. by 500% in one year. She’s also held five different positions within the organization since 2005, each change representing a promotion. And as far as Thomson is concerned, she’s right on track. “I love what I do because I’m a people person, and that’s the backbone of this work,” she said, noting that one of the most rewarding aspects of her job is working with the girls — like Solimar Fraticelli, pictured below. “The girls we serve are very involved in the fundraising, and they never were before,” she said, noting that a project that has had particular impact is a series of facility visits dubbed Strong, Smart, and Bold Tours, for which girls are trained, by Thomson, in public speaking and social skills. Thomson said more than 200 people have taken these tours, designed to inform the community about what’s happening at Girls Inc. But in addition to philanthropic work, she’s also passionate about moving her entire industry forward. As a board member with Women in Philanthropy of Western Mass., Thomson helps identify professional-development opportunities for women in the field, and also stays abreast of trends within the sector. This is important not only because it helps her do her job more effectively, but it also prepares her for the future, for which she has some very specific ambitions. Once Michelle Abdow got her feet wet in marketing, she had to dive in. Succeeding in a world as fast-moving as advertising, one in which players need to stay on top of trends, if not ahead of them, requires a broad approach to reaching customers, said Abdow. Like many of this year’s Forty Under 40, Abdow balances work and home responsibilities — she and her husband have two children — with a healthy dose of community involvement; she’s on the boards of the Salvation Army and the Springfield Technical Community College Foundation, donates PR and advertising for the Shriners Circus, and helped bring back back the Coats for Kids program in Springfield, among other efforts. That’s Abdow, always making a pitch. One career was beginning while another was ending. And a local success story was born. Andrea Hill-Cataldo was pursuing her graduate degree at the Isenberg School of Management at UMass Amherst at the same time Kelly Services, a chain of employment agencies, was taking back its privately managed franchises; one of those had been run by her aunt, who had been with Kelly for 35 years. “So my aunt’s daughter and I started a company,” said Hill-Cataldo. “I was the sweat equity, and my cousin was the financial backing.” They hired two key employees of the former Kelly franchise, and Johnson & Hill Staffing Services hit the ground running in 1995. Working a flexible schedule and juggling work and home obligations — she and her husband have a 4-year-old son, Frannie — can be tougher than a typical 9-to-5 job, said Hill-Cataldo. That’s especially true for someone heavily involved in civic leadership, on organizations including Big Brothers Big Sisters, the American Cancer Society, and the YWCA. “It’s harder because there are so many responsibilities, and people depend on you for leadership, and you’re never done,” she said.